SALT LAKE CITY — The Utah Supreme Court has upheld public access to streams and rivers, siding with an advocacy group on entry to the waterways. 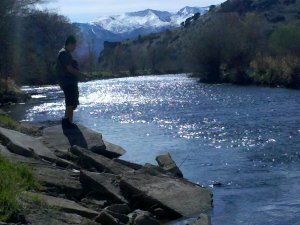 In a ruling published Thursday night, the state’s top court sided with Utah Stream Access Coalition in a lawsuit against private property owners along the Weber River. USAC sued, hoping to block property owners from cutting off their ability to get in the water along stretches of the river. The Utah Supreme Court upheld a lower court ruling that found the water is publicly accessible. “The district court ruled in USAC’s favor. It found that the one-mile stretch of the Weber River was ‘navigable water.’ And it accordingly held that USAC had a right of access to the waters in question. We affirm,” Justice Thomas Lee wrote. In 2011, USAC sued to ensure a one-mile stretch of the Weber River remained accessible for people seeking to recreate and for commercial industry. USAC has said the area is popular for kayakers and for trout fishing and private property owners along the river started putting up signs blocking access to the water. The state was largely neutral on the issue, but raised concerns for property owners about the threat of litigation. Copyright 2017, KSTU, a Tribune broadcasting station.